Why Grind Coffee Fresh Every Time? Burr or Blade? 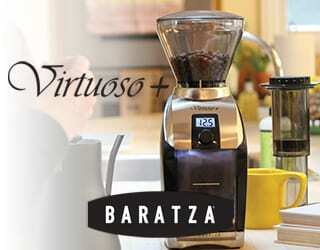 Home Barista Why Grind Coffee Fresh Every Time? Burr or Blade? First things first…why bother grinding fresh coffee every time instead of just buying it pre-ground? It’s fresher – whole beans have a much lower surface-to-air ratio than ground ones, so stays fresh for longer. 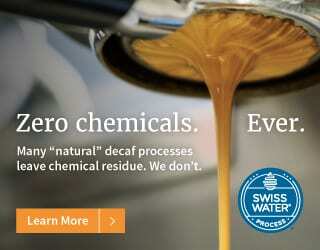 Tastes better – easy way to maximise freshness in your morning “cup of java” – oxidation begins once ground. It takes about 15-20 minutes for the subtle volatile aromatic compounds and oils to dissipate. Why not capture the compounds in your cup and enhance the taste? You can grind the beans as fine as you like them. Feel like a barista! – grindin’ those beans baby! 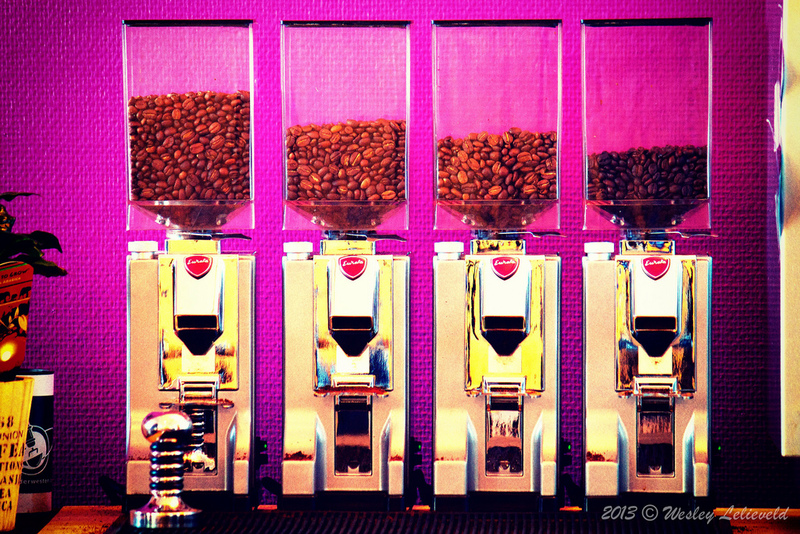 Ok, you get it, “it’s all in the grind!” Next question is…which grinder to choose? “Cheap as chips” blade grinder or a more lavish Burr grinder? What’s the Difference Between the Two? And What Is a Blade/Chopper Grinder? And How Does It Work? It’s basically a metal blade attached to a motor which spins to chop up the beans. The blade cuts the beans so you can roughly control the fineness by how long the grinder runs for. Basically, imagine hacking all your beans together up with a knife/glorified food processor. 1. Simple, dependable and cheap. 1. 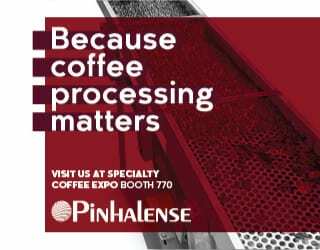 Inaccuracy/inconsistent brew quality – it tries to simultaneously grind all the beans. Coffee grounds can be uneven in size as the blade chops it all up aimlessly. This means you have coarser un-grinded chunks, which are under-extracted and you are left with tiny little over extracted coffee particles. 2. Coffee dust – this dust can clog up the coffee machines filter or go through your cafetiere filter into your cup. 3. Heat is created by the blades friction – this can give the final coffee a burnt and bitter taste. Especially if you are to get a fine grind and are therefore leaving the grinder running for a longer period of time. What Is a Burr Grinder? And How Does It Work? The beans are crushed between “two burrs” – a moving grinding wheel and a non-moving surface. The positioning on the burr is what regulates/controls the ground size. If the distance between the two burrs is moved slightly, a gap is created allowing the crushed particles to pass through when they are sufficiently grinded. Imagine….shaving each bean one-by-one into uniform flakes. – Uniform grind size – more evenly and equally extract the flavour out of the coffee. 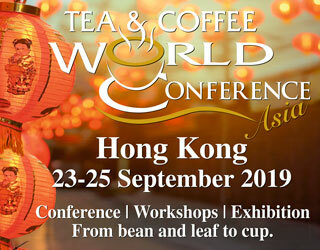 – Essential aromas and oils of the coffee are preserved as the grounds are not overheated. – Precise and smaller (if needed) grinds. Burr is suitable for espresso, Turkish or french press. 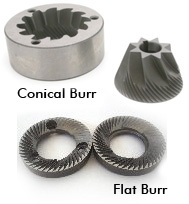 Conical Burr – in our opinion, this is the best! The burr spins slower than the wheel model, making them quieter and less messy. The coffee flows and you can use this for oily or flavoured coffees as it’s not likely to clog up. The larger burrs even dissipate the heat better. – Clean the grinder regularly – especially after flavoured coffees. And that’s all! The Burr grinder does all the work. 1. Empty all the coffee after each grind especially that accumulated under the grinding blades. 2. Don’t grind for more than 15 seconds – avoid heat created by the friction in the blades. 3. 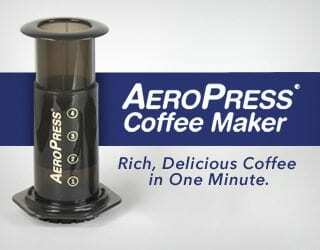 Shake the grinder as it runs to distribute the contents more evenly. Can Filter Basket Shape Affect The Flavor of Your Coffee?